Mountains and Maps, is a wholly independent company specialising in outdoor activities such as walking, cycling and multi-activity operating primarily in the south of France. 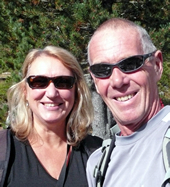 Owners, Merv and Jane Capewell, have worked in the outdoor industry for many years and have a vast amount of experience to ensure a trip providing great fun along with inspiring and rewarding challenges. Along with Merv we have a range of fully qualified guides (IML) available, all carefully selected to provide a high level of guiding ability, local knowledge and safety. Back-up management is provided by Jane Capewell who makes sure all aspects of your trip are fully met. Merv was a member of the Langdale and Ambleside Mountain Rescue Team for ten years, in that period holding the post of Chair and receiving the Queen’s Jubilee Medal for his Services to the Community. As well as being a guide for international activity tour companies, he has been an assessor for one of Europe’s largest tour operators for many years, training and assessing their new walking leaders. He has also cycled most of the mountain bike routes in the UK’s Lake District and completed the annual 100km Coast to Coast ride in South Australia. First and foremost we want you to finish your trip with the same enjoyment and love of the outdoors which we all have at Mountains and Maps. From our many years experience walking and cycling all over the world, we encourage you to appreciate and feel privileged to be in some of the most beautiful and interesting areas we can find. Our respect for the environment means we aim to leave as small an environmental footprint as possible from our trips. Supporting local economies is also important to us, so wherever possible we will use local suppliers and produce. Along with providing an active trip we have an holistic approach to health and well-being. Guests come from all walks of life and often arrive stressed, over-worked and in serious need of a break. Our aim to is to relieve every-day tension. Spending some time cycling or walking every day may not be everyone’s ideal holiday, but the results speak for themselves. It won’t solely be physical benefits but emotional and mental benefits also occur during an activity holiday. Most of our guests leave invigorated, relaxed, fitter, with a renewed sense of equilibrium and clearer perspective of life. As well as having a brilliant holiday. Why use an IML (International Mountain Leader) Guide? Mountains can be dangerous: weather can change in almost an instant and unexpected injuries can happen. To get the most out of having an activity holiday in the outdoors, stress-free, it is best to go with a fully qualified guide. That’s why we only use trip leaders who are fully qualified to ensure your trip is safe and enjoyable. The British Association of International Mountain Leaders (BAIML) is a full member of the Union of Mountain Leader Associations (UIMLA) looking after the interests of International Mountain Leaders (IMLs) working in Europe. UIMLA and IFMGA (International Federation of Mountain Guides), represented in the UK by the British Guides Association, are the only internationally recognised mountaineering organisations, whose leadership qualifications are accepted outside the country of origin. Mountain professionals wearing the badge and carrying the carnets of these organisations have been trained and assessed to internationally respected qualifications of each member country. Don’t settle for anything less than the best…. Merv has a vast amount of mountain experience from around the world and is a member of the British Association of International Leaders (BAIML) and affiliated to Syndicat National des Accompagnateurs en Montagne (SNAM). He’s also a Level 2 MIAS (Mountain-Bike Instructors Award Scheme) Cycle Leader.